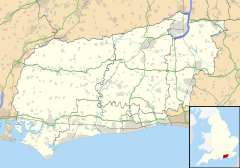 Adversane is a hamlet in the Horsham District of West Sussex, England, located 1.5 miles south of Billingshurst (where, at the 2011 Census, the population was included). It consists of a cluster of houses and a public house (the Blacksmith's Arms) at a crossroads on the A29 road, on the Roman road named Stane Street. The hamlet was known as Hadfoldshern until the 1850s. The Blacksmith's Arms stands beside the site of the blacksmiths shop, where Gaius (George) Carley was the last of many smiths to work the forge until it closed in the 1960s. He lived at Grigg's Cottage, a half-timbered cottage opposite. Stane Street cottages, opposite the pub, were probably built using the Roman road as their foundation, as the road deviates slightly at this point, returning to its straight line a little distance further on, and the sandstone houses are precisely in line with both sections of Stane Street. They are in fact a single building, converted in the 1930s from a malt warehouse built by the Allen brothers of Horsham, whose activities are catalogued in 'A History of Horsham' produced by Horsham Museum. They were maltsters who smuggled malt from the continent during the Napoleonic wars and hid their contraband in secret cellars under this and several other warehouses in the Horsham area. The cellars had a tendency to flood and were filled in during the 1950s together with the reputed secret passage to the pub! The malthouse was part of the setting for 'Martin Pippin in the Apple Orchard' by Eleanor Farjeon, published by W. Collins & Sons Ltd in 1921 and by Oxford University Press in 1952.